New Orleans Just back in town, we caught a lucky break with a showing of Beasts of the Southern Wild in a corporate cineplex in suburban New Orleans which featured a question/answer period with director and co-writer Benh Zeitlin and one of the principal actors and a local baker, Dwight Henry. This young filmmaker was impressive, committed, articulate, genuine, and an inspiration. His love for his work was palpable and his dedication at 29-years old to building a film “community” around this and his earlier work (Glory at Sea) was spot-on and could make a important and permanent contribution to the entire New Orleans and southern Louisiana community. For that reason alone I would heartily recommend that folks should go see the flick, pay full price for the tickets, so that it makes a killing, and builds a future. The best is yet to come from these folks! The story Henry told of trying out for the film was random and wonderful. His bakery at the time was across from the casting office and the crew used to pick up breakfast there and left flyers for tryouts. One day he sauntered over to give it a shot, and then went back to baking. Asked to cut a 2nd take, and then he went back to work. The bakery moved and reopened under another name in the Treme neighborhood of the 7th Ward, and finally they found him again and told him he had the part. He turned them down three times, before Zeitlin convinced him that he could practice after midnight while he was working at the bakery. In a classic New Orleans question, one person asked him where he went to high school and we clapped proudly, loudly and alone when he said he graduated from Fredrick Douglass across the street from our house, even though it was a decade before we moved here. All of the cast for this indie movie done for $500,000 from what Zeitlin said, were first-timers and one had to admire Zeitlin’s patience and devotion to his vision to take the risk and make the climb with Henry and the rest of the gang. This is a different movie in a lot of ways than standard cineplex fare. It’s a bit of magical realism of sorts shot from the perspective – and fears – of a 6-year old, who was excellent in many ways, and includes some fantastical “monsters” that are filmed to seem gigantic, thawing from the prehistoric deepfreeze of Antarctica and arriving in South Louisiana at the water line on the other side of the levee walls in Terrebonne Parish. I actually loved all of the parts of the film with these Maurice Sendak-style creatures arising live from “Where the Wild Things Are.” I even more loved hearing Zeitlin talk about how he and his team had raised these wild boars from 2 weeks old and trained them to do the stunts filmed in the movie with popcorn. For me they were the best actors in the film, and I would have loved to have been at the barbeque! The film is powerful and effective in its unique way of raising the issues of global warming, coastal erosion, and the dangerous and tragic fragility of South Louisiana and its fight to survive culturally and physically. The politics there are sound and the child’s understandings and misunderstandings of the reasons and wherefores seem true. On the other hand what never felt authentic to me was life in the “Bathtub” and its cast of characters. Zeitlin to his credit spent 8-months living at the tip of Terrebonne Parish trying to get it right and pulled many pieces of the movie from the reality of the struggles against the environment, for place, and to protect home as people know it, but too many of the assembly down there come off as caricatures more than real people. There’s a lot of drinking, loud music, yelling, cursing, and exotic, down-at-the-mouth strangeness and chaos in the gang, but not enough of the quiet hardscrabble life that even emerges in television shows like Swamp People, which is bizarre in another equally peculiar way. 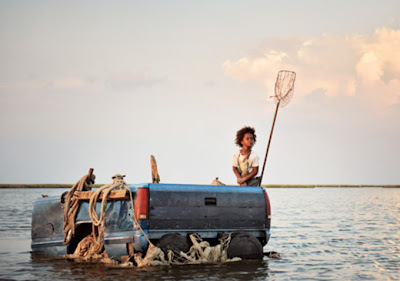 Nonetheless, the characters have a sense of ne’er do well, misfits and discards of the “southern wild,” but not really of the Cajun, Houma Indian, oil, fishing, and trapping culture and patois that dominates these communities where I worked and visited when offshore on the oil rigs or organizing fishing communities over the years. And, maybe this is unfair to expect a fantasy to still be authentic, but it is so often an error in telling the stories, both true and false in Louisiana and the South that it is hard not to cringe when seeing another MTV type set shot of the crew escaping from an evacuation center or coming over a levee hillock or whatever that seems more Beatles Hard Days Night than 21st century hell-on-wheels Louisiana. When Zeitlin answered a question conceding that the old Mel Gibson Mad Max films and Road Warrior had been models and inspirations for their film, I got it a bit more. These characters were supposed to be caricatures, so perhaps I’m just not hip enough to go to the movies and see films that echo of Katrina and fight to return home and claim home and not take it personally. Unfortunately, I think great film efforts like Beasts of the Southern Wild are important in how people see our struggle and join it, just as Zeitlin and his team have now come here and signed up for the fight, so I look forward to Zeitlin’s next films as he gets deeper and more engaged in the full community and its subtleties and comes to an understanding that is different than the wild and zany attractions our part of the world will always hold for many new to our charms and real dangers. 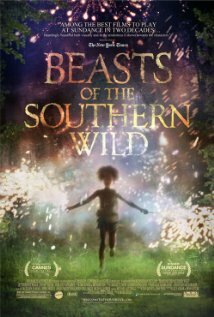 This entry was posted in Ideas and Issues and tagged Beasts of the Southern Wild, Benh Zeitlin, Dwight Henry, Houma, katrina, louisiana, magical realism, New Orleans by Wade. Bookmark the permalink. especially with such heroic performances from unknowns. Thanks for the review. This movie has been on my list for a while. I am looking forward to seeing it!